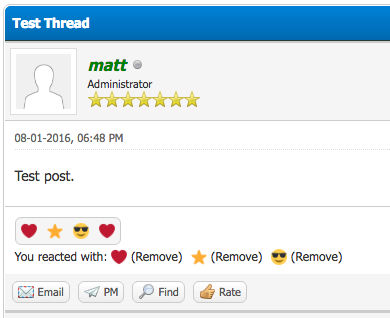 This plugin allows you to add emoji reactions to user's posts. Choose whether to group the reactions and display a count, or display them in a linear order of when they were received. 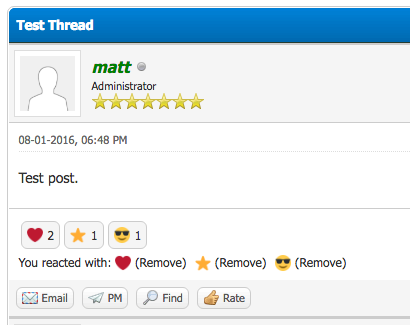 You can also view the most given and received reactions on user profiles. 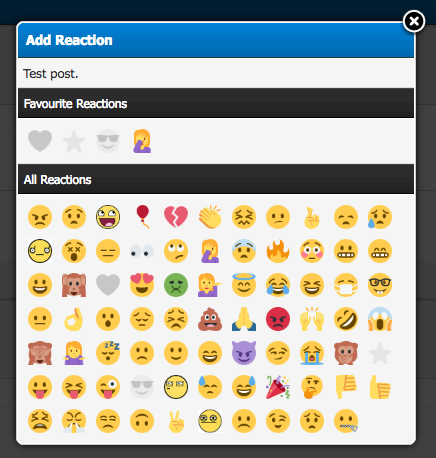 Go to ACP > Templates & Style > **choose theme** > Add Stylesheet > enter 'myreactions.css' (without quotes) into 'File Name', select 'Write my own content', paste the content of ./myreactions.css into the editor, and save. 27/09/16 - v0.0.1 -> Initial 'beta' release.